Here it’s a few days after Thanksgiving and you’re wondering what to do with some of that leftover turkey, other than sandwiches, of course. This is a soup that will be a great change from the usual turkey casseroles. If you can find some, use Baby Bella and brown mushrooms in the soup for even more flavor. Slashfood is having a contest called Lovely Leftovers Day where they’re asking food bloggers to show what they made with their leftover turkey. I’m entering my soup, because it tasted incredible, even though I was not totally satisfied with the photo. I’ve decided it’s really hard to get good photos of soup. I still have a lot to learn about soup photography, but I’m pretty good at soup making! Put stock or broth in soup pot with turkey and thyme and heat to low simmer. Melt 1/2 T butter (or olive oil) in small frying pan and saute onion and celery 3-5 minutes. Add to soup pot with water, mushroom base, and soy sauce and simmer 15 minutes. While soup simmers, saute mushrooms about 5 minutes in 1/2 T of butter or olive oil. Add mushrooms to soup and simmer 15-20 minutes more. In same pan that mushrooms and veggies were cooked in, melt remaining 1 T butter (or add olive oil.) Whisk in flour and cook 2 minutes. One cup at a time, whisk 2 cups of soup liquid into the flour mixture and heat until mixture starts to thicken. Pour thickened mixture back into soup pot and stir to distribute. Taste for seasoning, add salt and pepper to taste. If mixture seems too thin, cook down for a few minutes. When soup has reached desired thickness, add wild rice and cook 2-3 minutes. Add half and half or cream, stir in and heat thoroughly but do not boil. Serve hot. This recipe would be a “once in a while” treat for South Beach Dieters if you use butter, cream, and white flour. If you wanted to make it more South Beach Diet friendly, replace those ingredients with olive oil, milk, and whole wheat flour. Jennie Lou, so glad the soup was a hit and glad to hear you're enjoying the blog too. My parents came over for dinner last night and I made this soup for them, I didnt have leftover turkey so we just grilled some chicken breasts and diced them up for the soup….my parents, nor my boyfriend, could stop saying how amazing the soup was. It is so so yummy. My boyfriend and I are in phase two so I took the south beach suggestions…besides the flour…I only had regular 🙁 … But it was so so delicious!! I can't wait to have some for lunch actually. This website is my newfound addiction! 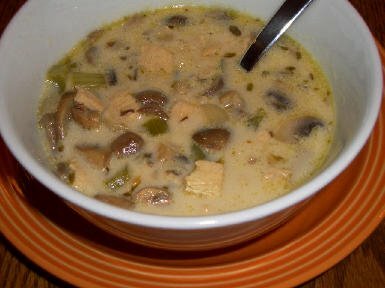 ~M, I do have this Turkey and Wild Rice soup recipe which is a lot healthier! You might like that one if you like cabbage. Always more turkey soup recipes coming! I don't think this would freeze well with the cream or half and half (and this is an old recipe, I probably wouldn't use either of those nowdays.) Can't see why it wouldn't freeze without that. I make a very similar version of this soup only I use a drizzle of olive oil instead of butter (to keep it kosher), cook it in the crockpot while I'm at work, and add the wild/brown rice mixture raw. Personally, I think the homemade stock makes the dish! It's so fabulous that a co-worker asked me for the recipe and even her picky son likes it! My version also does not include flour or cream/half-and-half. My question is, what are your thoughts on freezing this soup? I've never frozen mushrooms before because my husband didn't like them until recently. (He's the best taste-taster ever, always trying whatever I put in front of him!). Thanks for your input! Lyn, I just wish we had Trader Joe’s here! Glad you liked it. Becky, it’s a VERY old picture. I’m not a great photographer, but I do think I’ve improved! Glad the recipe was better than the picture, that’s what matters. This recipe was terrific!! I kept losing it but found it thanks to your picture. Your picture didn’t do this recipe justice. It’s a good picture-but your recipe is better-good instructions too. I sent it to my sister in Oregon and she’s preparing it right now!! This recipe was great with my little shortcuts. I got the already sliced and cleaned crimini mushrooms from Trader Joes. I used beef broth which darkened the turkey a little (I used it because it was half the sodium-even lower than vegetable broth) but when you add the cream at the end-the whole thing lightens up. I used the Trader Joes already cooked Jasmine rice, slivered the onions (I used sweet Mayan onions) to look like )))) by cutting the tops and bottoms off the onions and slicing real thin. Then I took the celery and instead of cutting them like ) I cut them about an inch and and halved them length wise for a nicer look. That was the very first time I made a Rue. I didn’t know how easy it was. I cut the recipe in half because its just me and Jack won’t try it. I’ve now got two Tupperware storage bowls ready to freeze and I’m stuffed!!! Oh yeah, while preparing the meal I worked on a glass of Reisling I picked up for a song at Trader Joes!!! And no I don’t work for Trader Joe’s!! kalyn – i didnt have a clue til two weeks ago, when in france, the Belgian friend we were staying with shared some with us. It is a delicious Beglian soup made with rice and vegetables and chicken and cream. I am hoping to research the recipe and see if I can make it sometime. Rachel, Alanna, Jan, Sam, Lisa, and Cookiecrumb- I feel so lucky having so many great women reading my blog and leaving me such nice comments. Thanks to all of you. Sam, I have no idea what watterzooi is, but I hope it’s good. Lisa, yes I did create it. I love creating more than I like following other people’s recipes. I’ve never been a very good follower. I think it’s that oldest child of ten thing haunting me. Lisa is right about the brown shrooms. Kalyn! Dang, that is exactly the soup I would make if I had leftover turkey. Wild rice and mushrooms, and oh, my tummy is rumbling. But: No leftover turkey. We ate “out” this year. And there was no good gravy at all. So, we’re looking at roasting a turkey within the next month. Cookiecrumb needs her gravy. And then we’ll have that soup. Kalyn–Looks really good! Did you create it? I have to disagree–I think you have the food photography down pat!